I’ve noticed that several of my readers are medical or nursing students still learning basic clinical skills. I’d like to share something that, once I got around to trying it, has stood me in very good stead indeed. More years ago than I care to disclose, when I was a 4th year student on an “outside” rotation, I met a crusty old FP with a tic disorder we never spoke of, and a zillion little clinical pearls he was eager to share. Here’s one: when drawing blood or starting an IV, go in with the needle’s bevel down. Yeah. Right. What does an old guy like him know about drawing blood anyway, I thought. Just like all of you, I was taught that the bevel (the hole in the needle cut at an angle) should be up so you can see it as you go through the skin and into the vein. 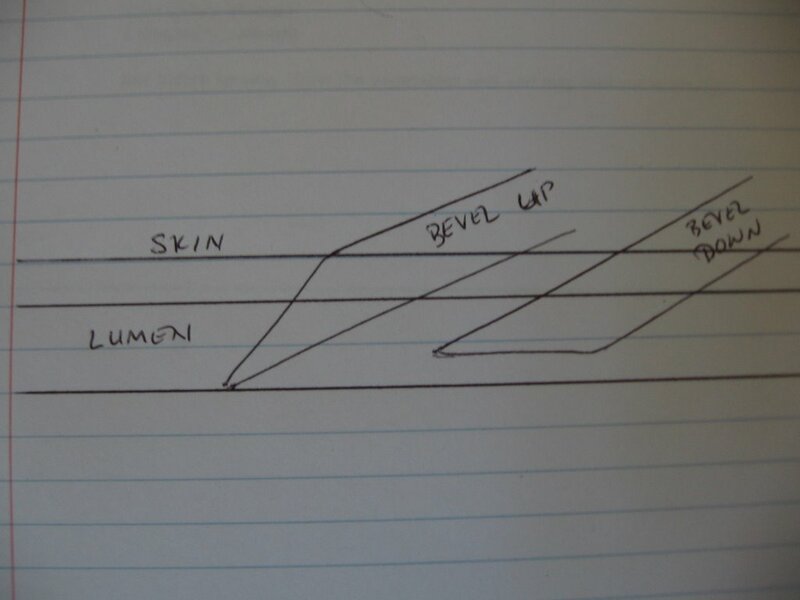 As you can see, entering the vein (at any angle) with the bevel down instead of up vastly increases the area of the bevel that gets into the lumen. It’s also much easier to avoid damaging the back wall of the vein with the tip of the needle, especially if you concentrate on exerting upward pressure once you’ve entered the vein. I know it goes against everything you’ve been taught, but consider trying it sometime; maybe when you’re not being watched/graded. Or you can do as I did and wait an extra decade or so to fine tune your skill. You have nothing to lose but a hematoma. I can’t wait to try this out! It will be interesting to see if the patient feels it less than with bevel up. Teaching tips like this one are hard to come by. Thanks for sharing! I’m currently a medical lab tech student in Canada with one week left of my studies. If I ever attempted a bevel down approach, I assure you I would be failed and considered incompetent.. Were you able to track how much of the blood you collected ended up hemolyzed? Did you spin down the tube and see the beautiful yellow of serum or plasma, or the dreaded cherry red of free hemoglobin? 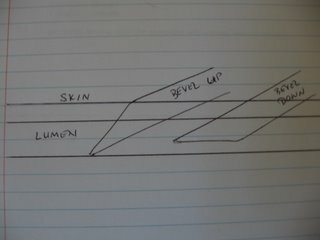 We watched a video from CLSI that demonstrated bevel down has the potential to shred red blood cells as the draw occurs. Bevel up gives a clear path for suction. What size of bore do you use? Smaller bore isn’t felt as often. Rarely hemolyzed. No more often than with bevel up, at any rate, a technique to which I’ve been forced to revert with the advent of “safety needles” whose flip-top cover gets in the way of bevel-down. Beautiful yellow serum every time. Intravascular pressure is the same regardless which way the needle points. Ever insert an IV facing AWAY from the heart?